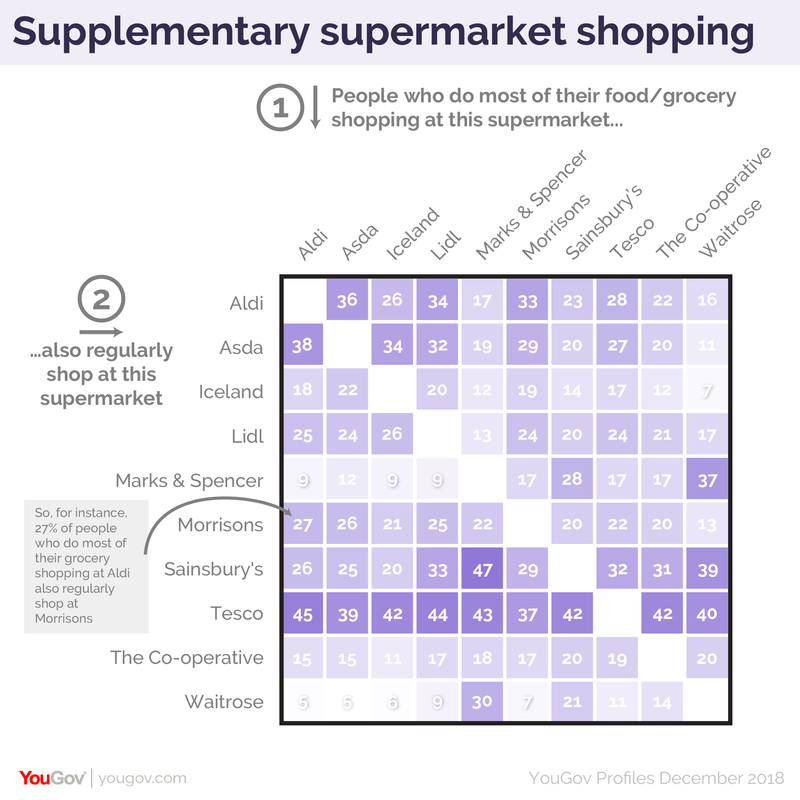 April 04, 2019, 11:00 p.m.
New YouGov Profiles analysis highlights Tesco’s dominant position in the supermarket sector: not only is it the most popular place to shop overall, but it’s also first on the list for additional shopping among people who buy most of their groceries elsewhere (between 37% and 45%, depending on the first-choice supermarket). Only among one group of shoppers is Tesco not the secondary supermarket of choice: those who do their primary grocery shop at Marks and Spencer, who are more likely to opt for Sainsbury’s for other bits and pieces (47%) than Tesco (43%). In fact, this M&S-and-Sainsbury’s crossover is the largest of any supermarket crossover. The strength of this pattern is only one-way, however – only 28% of those who do their main shop at Sainsbury’s do additional grocery shopping at Marks and Spencer. The least likely supermarket crossover is between those who primarily shop at Aldi or Asda doing additional shopping at Waitrose – just 5% in each case say they do so. In fact, Waitrose tends to get fewer crossover shoppers than any of the ten supermarkets we looked at. A notable outlier is crossover shoppers coming from Marks and Spencer (30% of whom do additional shopping at Waitrose). This relationship is reciprocal, with 37% of primary Waitrose shoppers doing extra shopping at M&S (although they are still more likely to shop at Tesco and Sainsbury). The most drastically uneven flow of shoppers is that between Tesco and Waitrose. While 40% of Waitrose shoppers also shop at Tesco, only 11% of Tesco shoppers also shop at Waitrose – a difference of 29 percentage points. With Sainsbury’s and Asda seeking to merge, the results show that 25% of Asda shoppers also go to Sainsbury’s, while 20% of Sainsbury’s shoppers make additional purchases at Asda.